Floyd Mayweather and Conor McGregor will get it on this Saturday after one heck of a hype train ride. The prize? A belt that would make the Million Dollar Man Ted Dibiase jealous. They call it the “Money” belt. 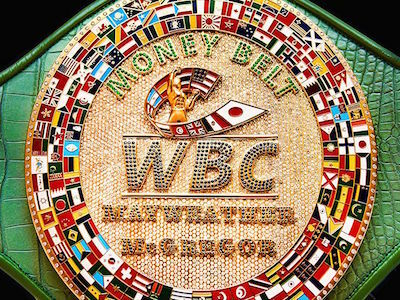 In order to celebrate this great event between the WBC champion, hero and the UFC hero Conor McGregor, the WBC has created the money belt. This belt has 3,360 diamonds, 600 sapphires, 300 emeralds, 1.5 milligrams of solid 24-karat gold and alligator leather that comes form Italy. If McGregor wins I think we can all agree that this will be worn to The Octagon every time he comes out.